There's a way to restore mainstream films to the Best Picture race, if the Academy is willing to consider it. Let’s not kid ourselves: The Academy of Motion Pictures Arts and Sciences created a separate but equal Best Picture award with the category “Most Popular Film,” and with that made the single most stupid and suicidal decision in the organization’s history. (Not the worst, however; that honor goes to accepting the blacklist in the 1950s.) But instead of condemning this move, as many have done already, let’s consider what the Academy really wants to achieve. For a decade, the Academy struggled to become more reflective of popular tastes. The expansion of the Best Picture category to allow as many as 10 nominees — itself considered a radical move when initiated for the 2009 awards — was intended to let popular studio hits become more prominent contenders. As a result, more studio movies were nominated, including “Toy Story 3,” “The Help,” “American Sniper,” “Mad Max – Fury Road,” “The Martian,” and “Hidden Figures.” However, in the last 10 years, the winners only became more specialized. Since the expansion, only “The King’s Speech” and “Argo” had a domestic gross over $100 million, and neither were blockbuster titles. The last four winners, even with the Oscar boost, struggled to reach even half that. None of this is to disdain the Academy’s goals of better representation, or possibly wins, for films that resonate with the wider public. Even if it meant different winners and nominees, I respect the idea of a more-level playing field that would allow films like “Black Panther” and “Wonder Woman” to be more competitive. But the Best Popular Film is not the path to success. 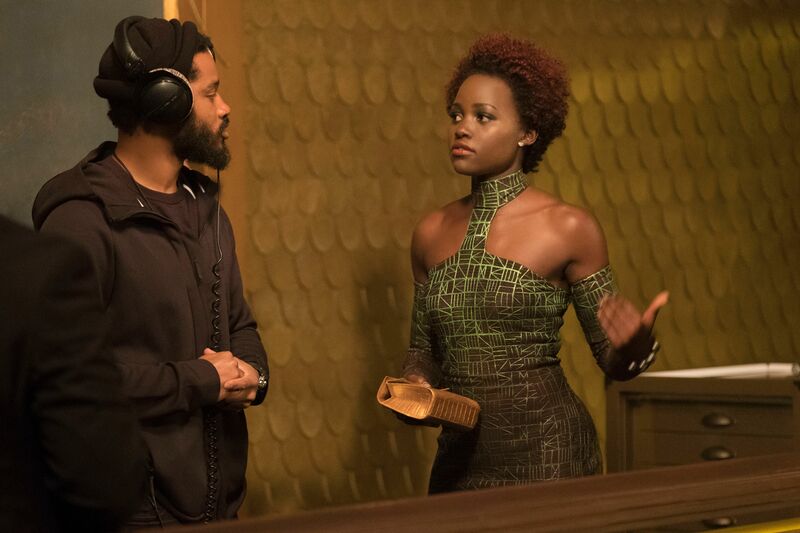 Ryan Coogler, Lupita Nyong’o on “Black Panther” set. 1. Return Best Picture to five nominees. 2. Make the nominations non-preferential. In the system that the Academy jettisoned in 2009, Academy members listed five choices for nomination, in order of preference. The system after 2009 still called for listing nominees by preference, initially up to 10 but later revised to a maximum of five, again ranked in order. In the system I propose, members choose five nominees and the order doesn’t matter; each selection carries equal weight. Accountants tally the selections; the five with the most votes receive nominations. The preferential system has been part of the Academy process for decades; it was meant to allow contenders with passionate support a shot at nomination even if they weren’t widely seen. However, it’s the bigger films that now concern the Academy; case in point is the failure of “Dark Knight” to chart in 2008. Anecdotal evidence suggests it had wide support, with many members listing it fourth or fifth on their ballots. “Skyfall” and “Wonder Woman” faced similar challenges. I believe if members listed five unranked films, more mainstream movies would make the nomination cut. 3. Make the final ballot voting for Best Picture non-preferential. When the Academy announced the expansion in 2009, the law of unintended consequences came into play. The Academy realized that with 10 nominees, and the winner determined by a plurality, the Best Picture could go to a film with 15 percent of the votes or less. Such a small minority is less of an issue when there are only five nominees. Since the nominee expansion, preferential voting likely resulted in a different Best Picture winner multiple times since the number of nominees has expanded than the old system would have yielded. Why? Because historically Best Director usually matched with Best Picture. And Best Director, with five nominees, is chosen by the traditional, non-preferential route. Historically, Best Picture winners align with Best Director winners, but three of the last five years have seen a split between Best Picture and Best Director. And in each case, it was the smaller, specialized film that won Picture with the help of preferential (“12 Years a Slave,” “Spotlight,” “Moonlight”), while the $100 million-plus hit won Director when it was a straight most votes out of five (“Gravity,” “The Revenant,” “La La Land”). Had the system I propose been in effect, I suspect the nominees would have been more populist, and some winners also in some cases better known. Would the “best picture” have won? I might prefer “Moonlight” to “La La Land,” others “12 Years a Slave” to “Gravity.” But the Academy is correct that if Best Picture strays too far from popular choices, Oscars will have trouble surviving. Say “Black Panther” was released last year and was one of five nominees, with the other four “The Shape of Water,” “Three Billboards Outside Ebbing, Missouri,” “Lady Bird,” and “Dunkirk.” With no preferential in the final five, I suspect “Panther” would have had an excellent chance of winning. The Board of Governors announcement may be hasty and short-sighted, but they committed to this new award and that makes revisions tricky at best. But if they want to achieve their goal of more popular films receiving greater prominence in the Best Picture category, and a better chance of winning, this might be a better way to do so. It is certainly worth considering.